The Permian Basin is taking center stage in the Texas literary world this year with a native son’s new memoir. Bryan Mealer’s The Kings of Big Spring: God, Oil, and One Family’s Search for the American Dream (Flatiron Books, 2018) paints a vivid picture of pumpjacks, Pentecostals, and the Permian Basin. The detailed multigenerational saga interweaves Mealer’s family history with the notable people and places of Big Spring. 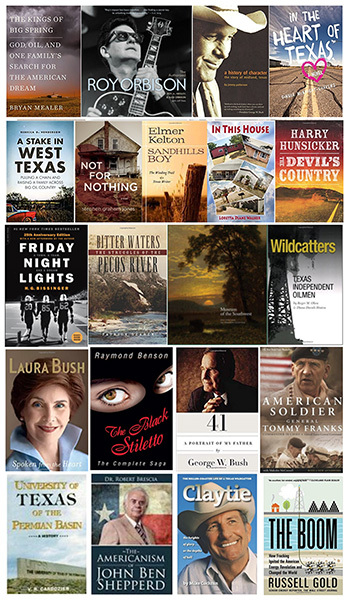 AUTHORS IN THE BASIN Below, from upper left, some of the authors who hail from, or whose works are associated with, the Permian Basin: Patrick Dearen, Laura Drake, Raymond Benson, Bryan Mealer, Teffanie Thompson, former Texas poet laureate Larry D. Thomas, Stephen Graham Jones; (second row) Seth Fishman, Ann Swann, Robert Brescia, Loretta Diane Walker, Richard Cox, Leila Meacham. Outside the Midland-Odessa “Petroplex” alone, other far-flung cities contribute to the Permian Basin’s literary heritage. Andrews is the birthplace of the late Elmer Kelton, one of the greatest Western writers of all time. Bestselling Texas saga novelist Leila Meacham hails from Wink, as does rock ’n’ roll legend Roy Orbison, the subject of a recent coffee-table biography. Stanton is the home of gothic/horror/fantasy author Stephen Graham Jones. Readers can visit many of the settings compellingly depicted in the book, including the fifteen-story Hotel Settles, 200 E. 3rd St., brought back to its 1920s-era glory via a $36 million restoration in 2012. You won’t have to explore far off the historic Bankhead Highway to spot the elegant Petroleum Building and the Alon (formerly Cosden) Big Spring Refinery, though these locales aren’t open to the public; you can visit a remnant of Big Spring’s old Webb Air Force Base preserved as the Hangar 25 Air Museum, 1911 Apron Drive. Big Spring’s Heritage Museum, 510 Scurry St., carries a good selection of regional history books and fiction, including Shine Philips’s folksy 1942 classic Big Spring: The Casual Biography of a Prairie Town. While you’re checking out Big Spring, you might also want to stop by the newly restored Historic Spring in the Comanche Trail Park. This historic landmark showcases new features, from three waterfalls and observation decks, to an expanded walking trail, plus eight sculptural panels telling the story of the area, all threaded through a landscape that reintroduces native plants and recreates the flow of the spring as it was long known to thirsty Indians, explorers, hunters, and animals. For help in planning travel, lodging, dining, and recreation, go to www.VisitBigSpring.com. Forty miles west on I-20 is Midland, the region’s “tall city” and home to the Permian Basin Petroleum Museum, 1500 West I-20, which reopened in April 2016 after undergoing an $18 million renovation since 2014. Anyone interested in science, geology, and the role of energy in Texas’s economy is sure to find many exhibits — and books — of interest at this museum treating Texas’s largest industry segment. The museum also hosts a distinguished lecture series which includes authors on a cross-section of topics. Two biographies of Midland natives, in particular, help visitors appreciate what makes this city tick. Mike Cochran’s Claytie: The Roller-Coaster Life of a Texas Wildcatter (2007) introduces oilman and onetime gubernatorial candidate Clayton W. Williams Jr. (whose Claydesta cluster of office buildings is situated along Big Spring Street on the city’s northern edge). Former Texas and U.S. first lady Laura Bush, a Midlander who has done wonders for literacy as a highly visible co-founder of the long-running Texas Book Festival, relates her own story in From the Heart. No visit to Midland would be complete without a stop at the George W. Bush Childhood Home, 1412 W Ohio Ave. Presidential history — and community literacy — are preserved in this modest mid-century residence. 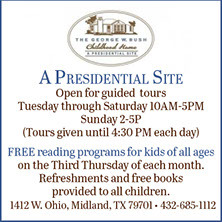 The institution expresses and interprets the history of one of America’s leading families by telling the story of the Bush Family and the childhood of George W. Bush in Midland, and to celebrate the lives of two presidents, two governors, and two first ladies. The home’s Laura Bush Literacy Bookshelf is always stocked with selections suitable for a range of ages, and any child can pick a book for free from pre-K to high school—one book per day. The Midland Public Library Centennial Branch, 2503 Loop 250 Frontage Rd., and Midland College, 3600 N. Garfield St., offer innovative arts and literary initiatives, including hosting the fourth annual Permian Basin Writers’ Workshop in fall 2018. Aspiring writers have the opportunity to learn firsthand from authors, editors, and agents. Note that Midland’s main library is temporarily closed, undergoing an eagerly anticipated renovation to be unveiled in 2019. BRANCHES, BOOKS AND LEAVES While most libraries plan trees outside, the Midland Public Library Centennial Branch (above) features them on the inside—with life-sized replicas indicating four common Texas species, including the state tree, the pecan. Other Midland museums also attract book and history lovers. 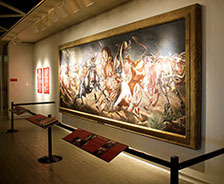 The Museum of the Southwest, 1705 W. Missouri Ave., produces exhibitions, programs, and events about science, art, astronomy, archaeology, history and culture. The Sibley Nature Center, 1307 E. Wadley Ave., celebrates the great outdoors of the Permian Basin at programs given at its 49-acre site in Hogan Park in Midland. Topical experts deliver talks and workshops on regional environment and history. The Sibley Center also houses informational exhibits, an extensive research library, and rotating displays. Enthusiasts may also appreciate yet another legacy of the Bush and Welch families: the I-20 Wildlife Preserve and Jenna Welch Nature Center. J. Evetts Haley (1901–1995), who grew up in Midland and became one of the most influential and prolific historians of the Lone Star State, endowed the Nita Stewart Haley Memorial Library and the J. Evetts Haley History Center (805 W. Indiana Ave.) and donated their core collections of documents and art works. As the late historian T. R. Fehrenbach put it, “In a country where more cows are kept than books. [Haley] became a scholar...he made himself master of the English language in all its manifestations.” The library today features more than 30,000 volumes covering western exploration, early railroads, and the development of ranching, mining, petroleum and politics, and welcomes casual visitors as well as researchers. The Presidential Archives and Leadership Library, 4919 East University Blvd. on the campus of the University of Texas of the Permian Basin. It is dedicated to the office of the President of the United States, rather than any individual who has held the position,and it also features exhibits on the presidents of the Republic of Texas, and on first ladies of the U.S.. From books and letters related to early presidents, to the seat that once furnished the Marine One helicopter, to Laura Bush’s yearbook, visitors will find an eclectic array of interesting artifacts, and the library is chock full of presidential biographies, memoirs, and related histories. Functioning as an interpretive museum as well as an active research and teaching center, the Presidential Archives, in this remote location far from any major metro area, richly rewards the student of American history and the bookish traveler. Hundreds of genuine books, pamphlets, and letters are on display, with enlightening, eye-catching interpretation. Do you know, for instance, which American president is considered to have published the first campaign biography? Or that the Garfield/Arthur ticket stumped in 1880 with a song book? For the scholar of presidential history, the library is a treasure trove of presidential biographies, memoirs, and related histories. A new interactive feature allows visitors to access further information about selected exhibits via electronic tablets mounted nearby. And finally, an on-site bookstore ensures that visitors may depart with a memorable souvenir of their visit. PRESIDENTS AND PLAYMAKERS Book lovers will appreciate the varied collections at Odessa’s Presidential Archives and Leadership Library (above, left and center, with Martin Van Buren’s pathbreaking campaign biography) and presentations at the Globe Theatre (right). For help in planning travel, lodging, dining, and recreation in the Tall City, go to www.VisitMidlandTX.com. Twenty-three miles west of Midland and long characterized as its blue-collar counterpart, Odessa claims its own corner of the literary spotlight in colorful ways. Where else, for instance, might you hear poetry read at a minor-league ice hockey game? Celebrating fifty years in 2017, the Midland-based Poetry Society of the Permian Basin held a contest for submissions to read poetry during the intermissions at an Odessa Jackalopes match in February 2018. Odessa is best known to many as home of Friday Night Lights, the legacy of Odessa Permian High School’s state-winning football teams, known locally as “Mojo” and chronicled in the bestselling book by Philadelphia sportswriter Buzz Bissinger nearly three decades ago. The popular book became a movie and then a TV show, and fans can visit Ratliff Stadium (right), 1862 E. Yukon St., and Permian High School, 1800 E. 42nd, icons of that era. Sports isn’t Odessa’s only claim to fame. A commitment to literary legacy recently returned the first Shakespeare Festival in more than a decade to Odessa’s Globe Theatre. The Globe of the Great Southwest, at 2308 Shakespeare Road on the campus of Odessa College, was inspired by William Shakespeare’s original Globe Theatre in London. The idea of the reconstruction of a Shakespearean theatre in West Texas originated in 1948 in Marjorie Morris’s senior English class at Odessa High School as a project of the OHS Shakespeare Club. By the 1960s, Morris had joined the facility of Odessa College, and her vision came to fruition in the construction of the Globe on the college campus. Morris oversaw the Globe until her death in 2001, and the theatre—by then expanded to include a reconstructed Anne Hathaway Cottage across the courtyard—underwent several transitions in creative direction in the years that followed. In 2015, Odessa College became solely responsible for the theatre complex. Visitors may tour the facility, or purchase tickets for performances. The literary arts have played a large role in Odessa in other ways. Odessa Arts, formerly known as the Odessa Council for Arts and Humanities, presents a variety of arts programming throughout the year. Past initiatives include the Books in the Basin festival and One Book, One Odessa, a community-wide read involving such literary luminaries as Neil Gaiman and David Sedaris. While Odessa Arts has no plans for either of these events in 2018, the organization will launch ArtPocalypse, a series of arts pop-ups from Labor Day to Thanksgiving. Speaking of arts . . .
Texas author and artist Tom Lea of El Paso (see El Paso, 2018 Bookish Destination #), is represented in Odessa as well, with the dramatic mural “Stampede” (right), originally commissioned for Odessa’s downtown post office in 1940 as part of a Great Depression-era program. In 2015 the 75-year-old painting was restored thanks to local funding of $100,000 and reinstalled at the Ellen Noël Art Museum in Odessa where it will remain on a twenty-five-year lease from its owner, the federal government. 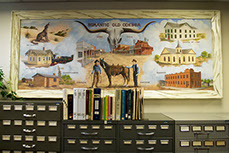 That same Lea mural is featured prominently in a book that Texas A&M University Press has recently made available again in reprint, Philip Parisi’s The Texas Post Office Murals: Art for the People. The Noël features other bookish activities as well, such as a regular monthly book club, or Art Tales, a weekly story time and art activity every Wednesday. Or take a book from the Little Free Library situated in the museum’s lush, quiet sculpture courtyard. The University of Texas of the Permian Basin, with an enrollment of 7,628, is celebrating its 45th anniversary in 2018. Each February UTPB features the African-American Read-In, an annual celebration of black history via spoken word. A different kind of narrative takes place at the UTPB Boom or Bust book club and non-fiction writing workshops. Professor Rebecca Babcock and Associate Professor Jason Lagapa were awarded an $83,799 Humanities Initiatives Grant from the National Endowment for the Humanities in 2017 to study the culture of energy production in the Permian Basin. As part of their project they have implemented writing workshops, book clubs, and a speaker series to help understand the Permian Basin’s energy and economic resources from a humanities perspective. Workshop participants craft memoirs or personal essays about living in the Permian Basin, and their experiences during boom and bust periods. The book club has met in Big Spring, Midland, and Odessa and explores bestselling titles about the oil industry. Where else can writers and book lovers take part in Odessa’s bookish life? Drop in at Ye Old Bookstore downtown. And borrowers and researchers, and visitors are welcome at the downtown Ector County Library (left), which boasts an excellent local history and genealogy section. For help in planning travel, lodging, dining, and recreation in Odessa, go to www.odessacvb.com.